It would be very useful to discover an artist from this period who had the obsessive attention to detail of later painters such as Hans Memling. 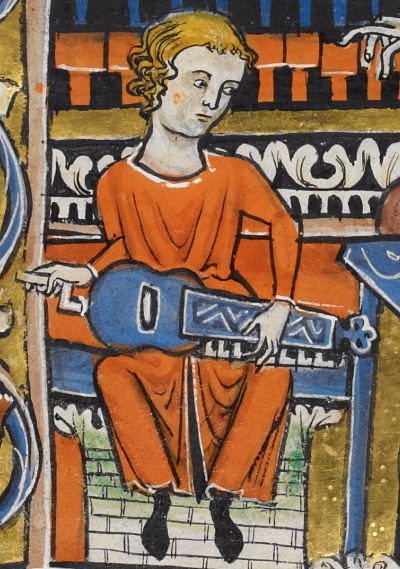 Alas, 13th century illuminators were rather more figurative, and many details are missing (such as the strings!). However, the overall size and shape of the instrument can be determined with a fair degree of accuracy. 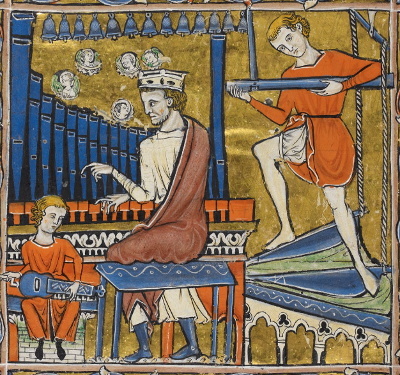 It is clearly an organistrum (early hurdy-gurdy), with three pegs, therefore three strings. It has a single row of keys, so it is diatonic, which one would expect for this period. There is no wheel cover, but the wheel slot is decorated with a simple painted edging. Eight keys are shown, but they're not in the right positions to create any meaningful scale. I have used eleven keys, which gives a useful range. After much experimentation, I arrived at a tuning and stringing schedule that sounds good, and makes the instrument sing, but also makes sense to people who already play hurdy-gurdies or keyboards. The instrument has a single chanterelle tuned to g, giving a range of g to d'. There are two drones, in g and c'. The chanterelle is an octave lower than a g' hurdy-gurdy. This gives a clear melody, but it sits "inside" the drones, producing a thick, complex texture. The open chanterelle sounds g, and the third key is c'. The scale is C major (or Ionian mode). However, I designed the keyboard so that some of the tangents can be turned to give alternative notes. B flat, E flat, F sharp and C sharp are available. This allows a lot of scope for tuning in various modes, even without altering the pitch of the drones, which provides even more options. The simple and very long crank, without a knob, is also shown in paintings by Jheronymus Bosch, but modern players would find it very awkward. I've therefore substituted a conventional hurdy-gurdy handle, which makes the instrument more compact. It comes with two straps, so it can be played standing up if required. It is finished in a distinctive blue wood stain, approximately matching the colour in the psalter illustration. That, of course, can be altered to suit your preference.